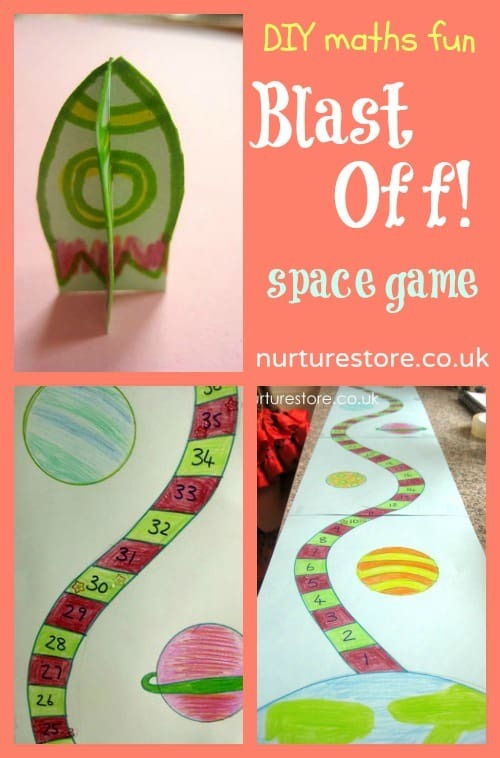 This space game is fun to play and gives you lots of scope to work on counting, subtracting, multiplication, number patterns, lively actions and space facts. It’s versatile and can be adapted for children of different ages – and it’s really easy to make. Here’s how to make and play Blast Off! together with a great selection of other space games and activities you can use to explore all about space. 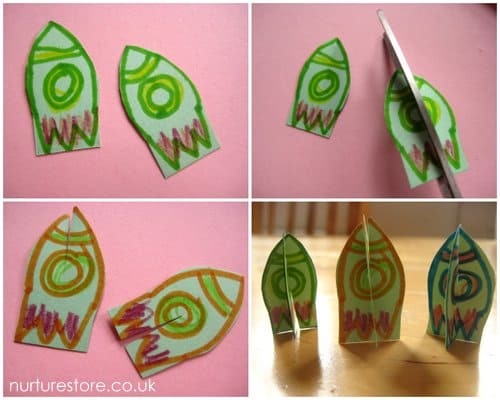 Getting all the children to join in making the board game and drawing their own rocket counters encourages them to feel the game belongs to them – much more fun and less like a lesson! Start by making your games board. We used four pieces of card fastened together with sticky tape but a roll of paper would work just as well. We drew Earth at the bottom of the board, another planet up at the top, and then made a zooming space pathway that connected the two. We’re using our game to practise lots of number skills, so each space our pathway is numbered (we’re using 1 – 50 to begin with). All the odd numbers are purple and all the even numbers are green. Numbers in the five times table have star stamps on them. This gives us some visual prompts to spot number patterns as we play. We drew on a number of smaller planets and moons to zoom past, which are also where we place our Rocket Booster questions (see below). This board games gives lots of flexibility to practise the learning skills that are right for your individual children. 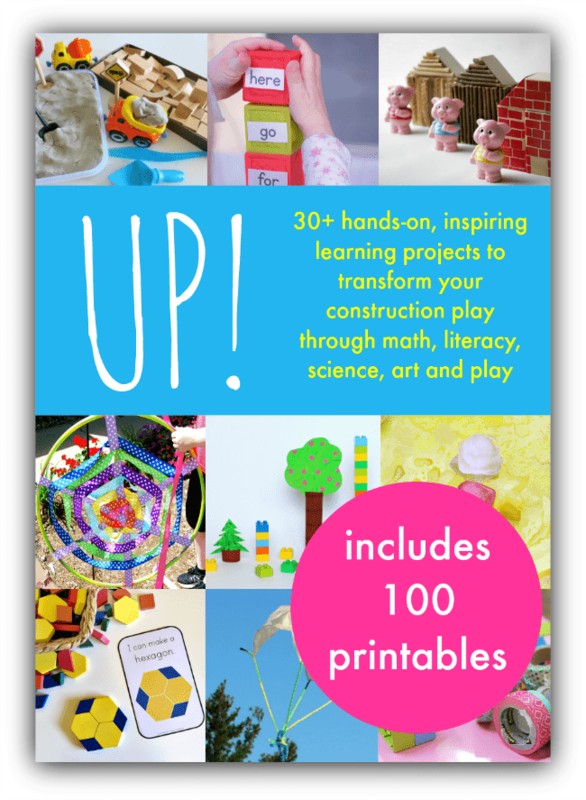 You can make things more complex as your children develop their skills, and it’s possible for a group of children, at different ages and stages, to play together – so great for a family, home school or classroom. The aim of the game is to blast off from Earth and fly all the way along the space pathway to reach the other planet. All the rockets start on planet Earth. In turn, everyone rolls a die (or spins a spinner, or picks up a number card). 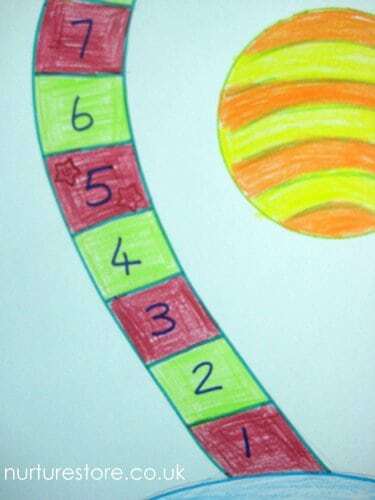 These number cards let you move along the space path way to reach the outer planet. Or you can work on addition – counting on (in your head or on your fingers) by the number you roll, and so adding it on to the number you started from. Then, moving your rocket along the space pathway lets you double check you got your sum right. You can add in some Rocket Booster cards to the game too. 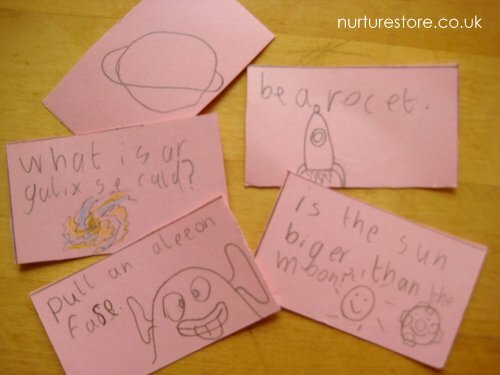 Make a set of cards with instructions or questions on. If you land on a multiple of five you have to pick a Rocket Booster card from one the piles (which sit on the planets and moons) and follow the instruction or answer the question. If you get it right you can boost yourself two extra spaces along the pathway. 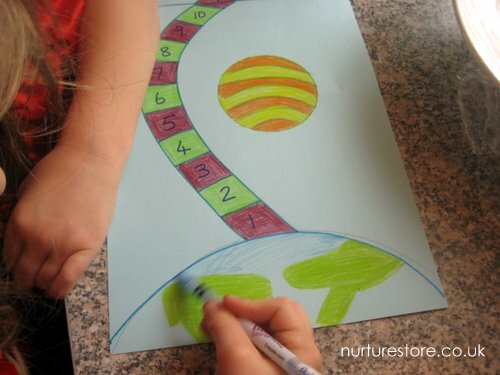 The first person to the outer planet can be the winner – but you can also bring in lots of subtraction practise if you go backwards back to earth! 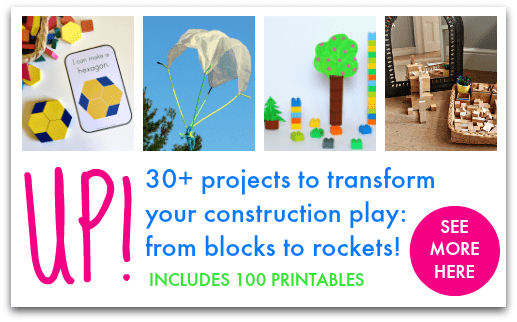 Ohhh this looks like a lot of fun, I love games like this that you create with your kids. Great idea! I have 2 more suggestions. If you make it big enough and laminate it you can have the children walk on it. Also, some numbers could be a “draw a card” box, where you can put different questions like ” go ahead as many places as there are moons in Saturn” or ” You fell in a storm in Neptune, go back 5 places” in order to practice substraction, addition and general knowledge. I will definately have a go and tell you how it went. Fantastic ideas pepy. Let me know how you get on with it.